A couple of months ago I finally accepted a referral for Lucas to see the speech and language therapist. Typically the very next day he spoke to me more than ever before. So many phrases came out I was totally amazed, it was incredible! I kept the appointment just to get a second opinion but the therapist was really happy with him and he’s been discharged without any need for further appointments. Even though he has developed slower he is still within a normal ability for his age. My main concern was that he would say a few words then plateau for several months but the last three months he has just been picked up the pace. Part of it seems to have stemmed from the arrival of his little brothers as he no longer has my undivided attention and has to fight to tell me what he wants. The thing I love most about his new grasp on language is that I gives me an open window into his imaginative toddler world. He has always chattered when playing, mostly gibberish, but now he is able to tell me what he is doing and more importantly, instruct me! He’s putting words together more often and everyday he will come out with something that amazes me. I wonder were he picks up all his little ideas from; what goes through his mind to bring out this wonderful world. 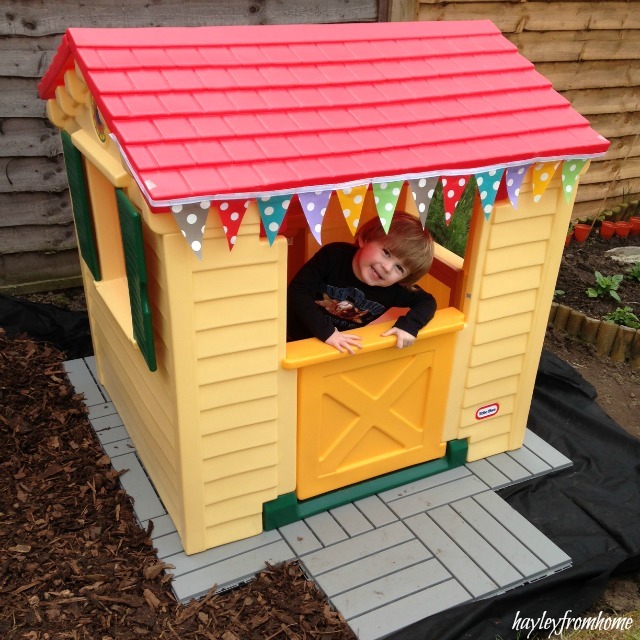 Just this week he got a little playhouse for the garden and after I attached some bunting he declared it a ‘party house’ and said ‘party day, my party day’ then sat inside saying ‘Happy Birthday’. It fascinates me how his brain links all these things together and now he can tell us all about what goes through his mind. The littlest things he does I find amazing; he ties a ribbon round his foot and tells me he’s ‘being a Doctor’, he looked though some toy binoculars at night and told me he could see Katie Morag. I could listen to him talk all day; he runs up and down our hall playing with his imaginary friend Simba and I stand in the kitchen quietly watching and smiling, not wanting to interrupt his little world. There is still a lot we don’t understand so we have to play guessing games to what he is saying; when we get it right his face lights up and enthusiastically says ‘yaww’. He started to say Mummy and Daddy just a couple of months ago; it is probably the best thing to hear him say ‘mornin Mummy’ when I go to get him up and ‘read it Mummy’ when it’s story time before bed. He talks to the babies and will go to tell them ‘it’s alright’ when they are crying or clearly let them know which toys are for them! He picks out his stories and tells us what is happening as he sees it. He quite clearly lets us know exactly what he wants to do, what he expects us to do and we get a lot of ‘NO’s’ when we get it wrong. I’m hoping to catch some of his chatter on film soon as there will probably come a time when he will never shut up and I won’t clearly remember how special this time is. We’ve waited so long for this, sometimes he will say something and my and husband catch each others eye and smile in wonder. It’s just incredible to watch this little person grow up. Monkey was very late with his speech, but now that is a distant memory. All of a sudden it clicks and it’s like a floodgate being opened. I still marvel at his vocabulary. Hope Lucas keeps up with his new words. Thanks, it just getting better and better everyday, even since I wrote this. It’s amazing after waiting so long for it to happen, I’ve heard so many Mums say the same thing you have but you still don’t really relax until it actually clicks into place!